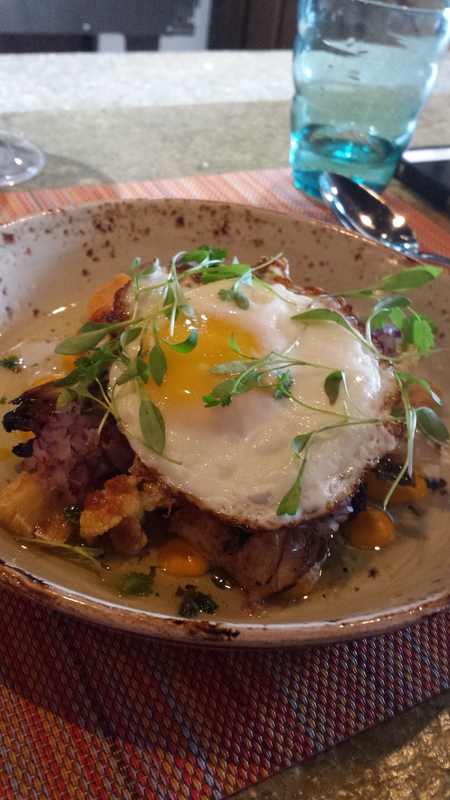 Several people have asked that I start reviewing local spots here in DC so I am starting a new feature, ACC’s DC. In it I will try to steer you all to my favorite places to eat, drink and shop here in the Nation’s capital. I am lucky enough to live within walking distance of the historic and always bustling H Street NE. Once the heart of DC’s commercial life, the street and the surrounding neighborhood was devastated by the 1968 riots following the assassination of Dr. Martin Luther King Jr. For decades the street struggled to regain its footing but a recent revitalization has really turned the area around. Scores of new restaurants and bars have opened, some terrific local small businesses have flourished and there will even be a new Whole Foods soon. Honestly its hard to keep up with the scene on H Street which is why it took me almost a year to try Ocopa. We finally made it there for a birthday lunch and it has become my new favorite spot. This Peruvian restaurant, tucked into an incredibly small space, is making the most out of what it has. 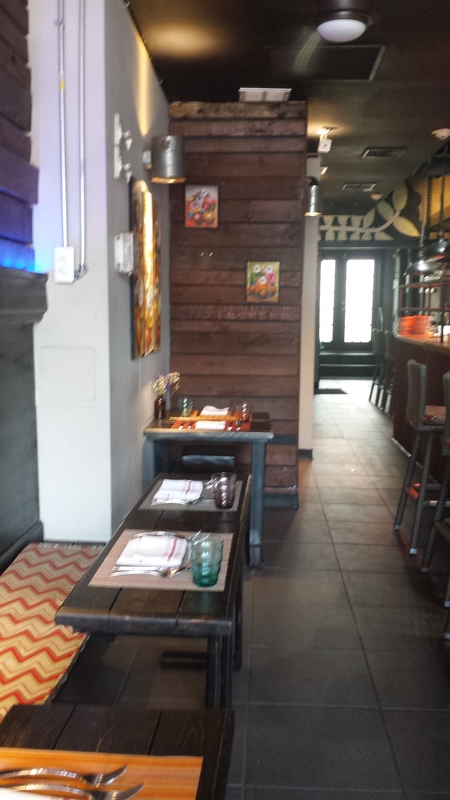 Small tables are crammed in the front of the restaurant by the garage door wall that can be opened when its nice out and line one wall. They also have seating at the ceviche bar where we sat to get a front row seat to the creative food they pump out of the insanely small kitchen. In the back is a small bar with an impressive array of piscos to try. Cute industrial touches like lights made out of paint cans are mixed with Peruvian art work. This is not the place where you can come with 6 friends and find a comfortable place to eat – it’s better suited for date night or catching up with a close friend. If you have never had a pisco sour then this is the place to try one. They have a whole pisco menu with different brands to try, pisco infusions with different flavors like tart cherry and kiwi, and two pisco cocktail menus. Most of them come with egg white frothed on top which sounds weird but is delicious. I started with a Mate, a pisco cocktail with smoked honey and Patrick got a Chief’s that included mezcal in the mix. 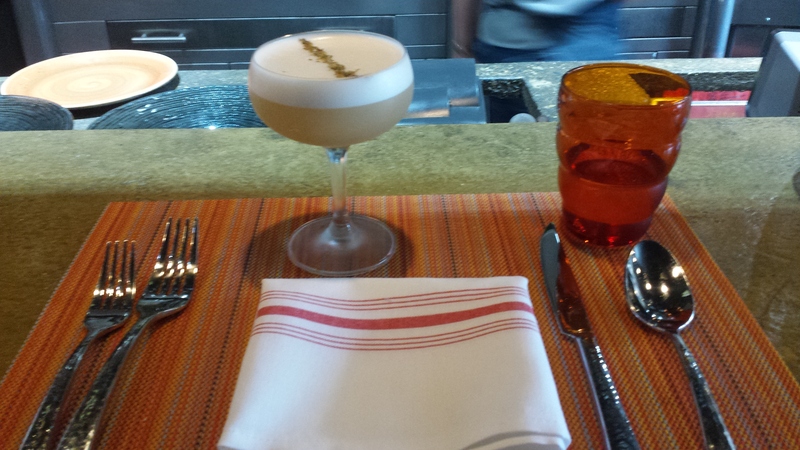 Be forewarned, pisco drinks go down smooth especially when it’s in the high 90s! With the drinks they served cancha, which is this amazing corn snack that tastes like popcorn. 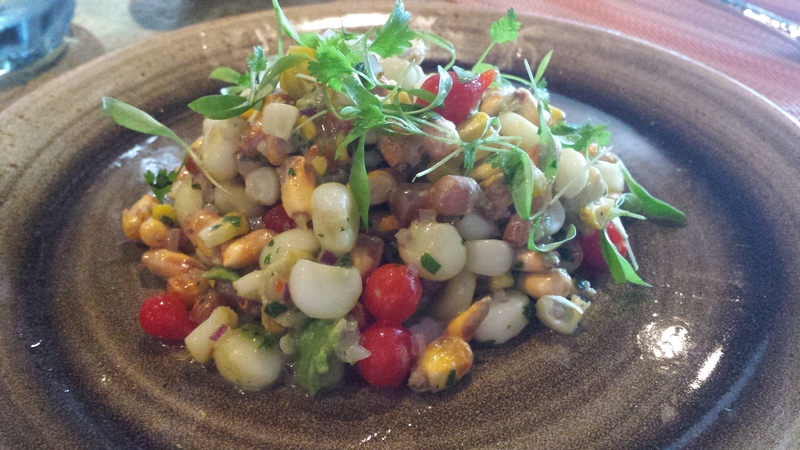 It was also in our Ensalada de Maiz (Corn Salad) along with like 30 other types of corn. Seriously this salad is like a love letter to corn that included regular yellow corn that had been grilled, the crispy cancha, and these huge corn kernels called choclo all served over a corn and avocado puree. Tiny pickled red peppers added the perfect vinegary punch and micro greens on top added freshness. While we snapped down that salad we were able to watch the incredible grill being operated. This thing is the real deal that is constantly being stoked and tended to by the cooks. I know it’s the reason why Patrick’s Pollo ala Brasa was so delicious. The chicken, after being sou vide was then thrown on the grill and then served with aji amarillo sauce, a fried egg and roasted cauliflower. 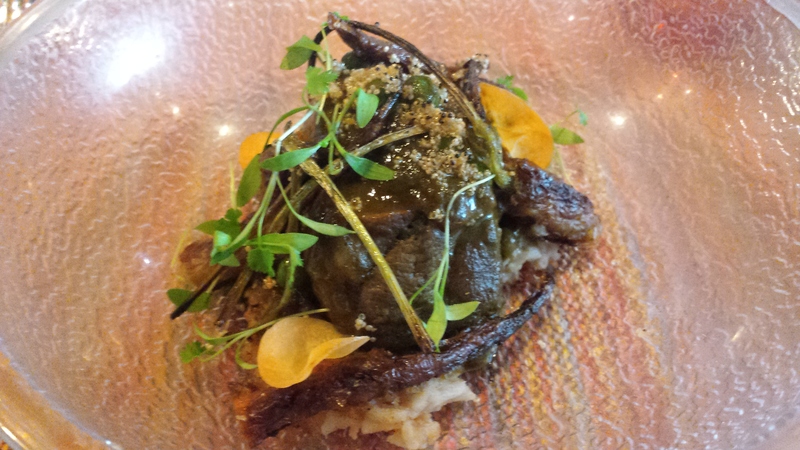 I had the Seco de Cordero, a braised lamb shoulder, served with carrots roasted right there on the plate with a high blow torch (sorry didn’t catch a pic of that!). Usually a dish like this might have been too heavy for the July heat but the bright cilantro elements really helped keep it light. 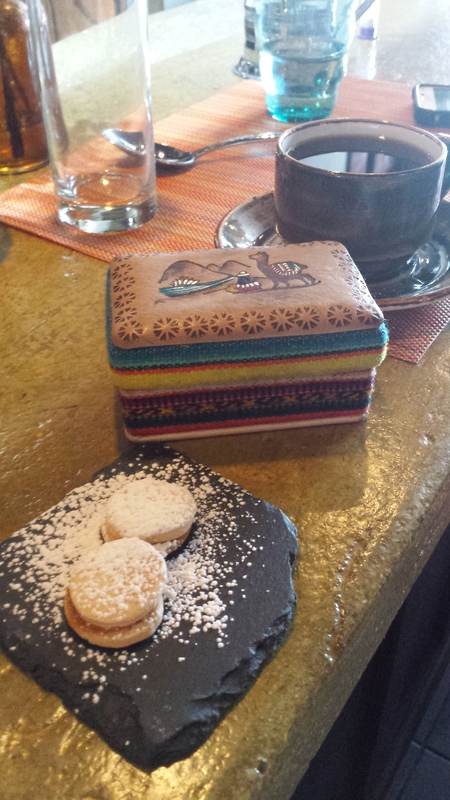 We ended the meal with some amazing french press Peruvian coffee and little cookies they serve with the bill (that’s tucked into the adorable little handmade box). The service was really attentive and friendly – I know quite a bit about Peruvian food but they are very good about explaining the menu and any unfamiliar ingredients. I loved how effortlessly they mixed traditional Peruvian flavors and ingredients with innovative new cooking techniques and flavors. Luckily they now take reservations through Yelp because this tiny place can get packed really quickly. DC locals definitely get this on your restaurant bucket list! What spot should I try next? Great review! This is one of our favorite places.